Really surprised to see this, thought GE would just outsource back to Sylvania once the Circleville, OH plant closed. The GE F15T12 here has all the likes of a Philips, looks almost identical to the old Philips F15T12s made in Mexico. What's intriguing is that this lamp doesn't have cathode guards, which are normally found in most Philips made lamps. Service Life: 9000 hours, will it actually? Where did you hear circleville plant was closing? Hopefully they're as good or better quality. Heh. Yeah. This'd be fun to lifetest and see how it goes. It doesn't seem that badly made. What sorta life test you do on these? 24/7 or switched for a few hours? 16/7 or whatever. Walmart still has full mercury old-school meatball GE F15T12/KB around me, but the GE Plant & Aquarium have this funky etch now...the rest are the older Ecolux etch. GE also began producing at least some of their F15T8 lamps in China recently. I wonder if these are made in the same plant. @FGS I have done lifetests where the lamps were lit 24/7. You know how fluorescent lamp life increases when they're lit for a longer period of time rather than lit up frequently? Despite the continuous 24/7 operation, some GE Indonesia F15T8s only lasted 4 months. Plain junk! @Patrick, I think the GE F15T8s from China are different. They look to be made in the same factory that makes the TCP F15T8s. I have this Philips sourced GE lamp lit for several hours now. So far, seems good. A lot of mercury discharge in the arc that I can see through the clear bands at the ends (remember the old Mexican made Philips F15T12s had the clear bands?). A little bit of mercury condensation in the phosphor at the ends. I was in lowes today and they have apparently gone to GE fluorescent lamps. Every one of them were rebranded philips. The boxes said made for GE lighting. What a shame. The last American owned lighting company is too big for what made it famous. They too will be unheard of just like Westinghouse is today. Even F32T8s and F40T12s? The ones here are actually GE made, it's only the slimlines, HOs, and F14T12s and F15T12s that are rebranded Philips lamps. Yeah, I find it weird to see what was once the biggest lampmaker now outsourcing. First time they're not making slimlines WTF. Didn't GE invent the slimline? This is worse than when Westinghouse sold its lighting division to philips. I think most fluorescent lamps that have names that most dictionaries (Google translate for examples) rejects or don't recognize (Circline, Slimline, etc...), are GE inventions. The only non GE fluorescent lamp that I know that have a name that dictionaries rejects, is the Westinghouse Circlearc. I haven't seen Slimlines in use for quite some time around here. They're simply not being used as much as they used to be so not many are sold. Hence GE quitting making the things. Sad but that's how things are. Used to be moneymakers but not anymore. Westinghouse stuff are still around. My Ace sells their bulbs. Made by other companies but the name lives on. So will GE. So I'm not sure where the "unheard of" come from. Where are the Westinghouse tv's, appliances, load centers, ECT. Anything Westinghouse is not made by George Westinghouse, just his name is put on it. That is where unheard of came from. Find me a Westinghouse plant owned and operated by Westinghouse with employees paid by Westinghouse. I have 7 F15T8's in use... I use them daily, 24/7, and I've had all of these lamps for about 6, maybe 7 months so far. color as the USA version, but it also has sylvania end caps, and electrode filament shield guards. lamps are using 1 lamp HPF trigger start ballasts. I dunno if Abco owns any factories in China so I can't answer that Westy factory question. But for a hidden Westy factory. Look at Philips factories. I know they have Westinghouse machinery. Salina kansas is not owned by Westinghouse any longer. I could have my own private lable put on some lamps but they would still be philips lamps. No Westinghouse factories exist. The only thing that remains is the name of dead man who was out to be successful. All that remains are people trying to cash in on George Westinghouse's name. If I bought a used car would it still be the former owners property? Would the former owner pay the repair cost? Just because it used to be Westinghouse machinery doesn't mean it still is. It's like the Cleveland browns, the real Cleveland browns are the Baltimore ravens. The new browns only have the same name as the original franchise. Philips replaced much of the old Westinghouse machinery with their own over the years. I think the only Westinghouse machinery they still operate is the U bent machinery, which is now in China, same factory symbol as the one above. Oh, I think Philips still uses the Westinghouse water based lacquer at the Salina, KS plant, as the phosphor distribution style hasn't changed. A few things from the Westinghouse era are still going today. Anything on the cap of these lamps? I have some daylights....I have a K&B in the bathroom in 24/7 service ( Sylvania made one . Much better than the Indonesian ones. WAY much better than the Sylvania made ones. I had 2 of those to lose vaccum. I also have a Chinese K&B in a lamp in the living room in 24/7 service. The Chinese ones have shields. If this tube was made at the same plant that make F15T8KB, and the BELL T5 we get in England, you are looking at quality lamps of rugged construction. We don’t have F15T12 in Britain except in vintage NOS, so it would be good to see the number of hours one of these actually lasts! And, of course, if it bands up in maturity! I just noticed it was a T12.....gotta get me one. As a side note, one of the local Subway sandwich shops is lit with F17T8 for HF. The GE lamps are heavily banded. 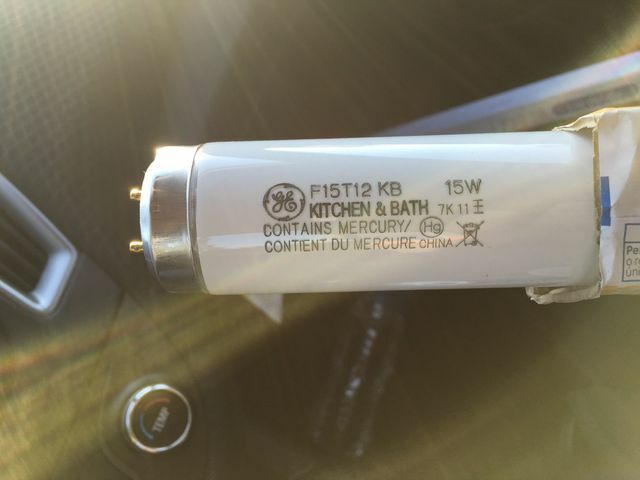 Yeah, the GE F15 T8 tubes are made in China too. I took a picture of one weeks ago. Link below. @TL8W no, nothing marked on the end caps. They're just rebranded Philips lamps made on Philips machinery at some joint venture in China. @Powell did you get pics of these heavily banded GE @ Subway? A pity to hear about Circleville, but this is indeed probably a good lamp - it was made by Fei Xin in China, a manufacturer who also produces many of the Philips T8 destined for USA markets. I have the F15T8/KB version. It does have guards on both ends. It also has the Philips flicker at the ends. jercar954, oh? Yours is F15T12 or F15T8? I have yet to see a F15T12 with guards. Mine is a T-8 that has guards. Powell W. has a daylight T-8 that also has guards. My K&B was installed on my computer desk lamp 7/9/18. It goes about 16 hours a day all week. So far, it had developed banding on one side. Interesting to note is that it really has lost a lot of lumen output almost to the point of an aged WWX. It will be interesting to see how long it lasts. When it goes EOL, I'm going to replace it with one of the SPX50 lamps I purchased last summer. Those are USA made, probably the Circleville plant. They are pre "HG" etch lamps. I know this is an old comment but i think GE F40T12 U-bend Lamps are also made by Philips now.